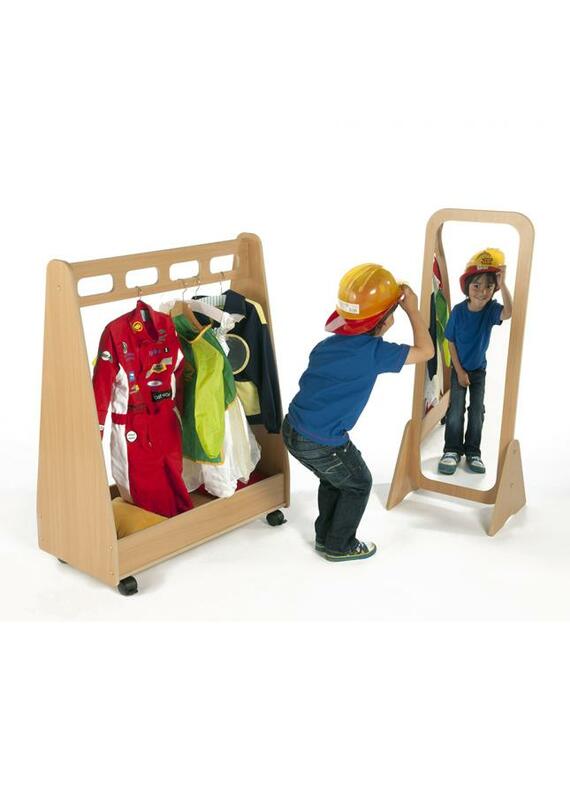 This kit includes the free standing mirror as well as the dressing up trolley. The free standing mirror can be assembled either horizontally or vertically depending on the age of the children and is manufactured in the UK using durable, easy-clean beech melamine board. The dressing up trolley features plenty of hanging space for fancy dress outfits as well as a storage box below for props. It is is manufactured with beech melamine board similar to the free standing mirror. Both products have rounded corners and tactile edges and the free standing mirror is built with a plastic mirror to provide a safe early learning environment. The free standing mirror and dress up trolley kit is the ideal resource for any children’s dressing up area in your school or nursery. Please note: The dress up outfits and props are not included with the free standing mirror and dress up trolley kit. For more information please Contact Us or call us on 01733 511121. View our full range of Children's Dressing Up play equipment.